Security rolls will help put an end to forging, counterfeiting, and fraudulent returns. Receipt fraud is a multimillion dollar problem in the retail industry. If you need to secure your receipt roll, try one of our printed products with security features. A low cost solution to the problem. 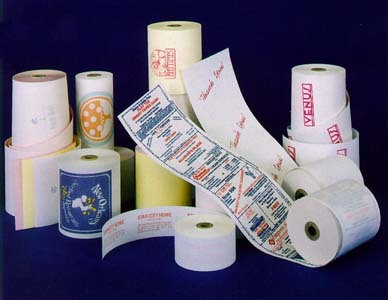 On printed rolls we may use special inks and copy features that provide a strong deterrent against fraudulent returns. Precise Registration between front, and back images. We even have a special paper that looks great in ivory, gray, or white. One or two-sided multicolored printing. Clear coat varnish, which is sensitive to UV (black) light scanning and invisible to the naked eye, and thermochromic, heat sensitive ink. Printing on single or multiply rolls. Security features may also be used to reduce fraud in ATM and credit card receipts. Demand for security features can only increase as awareness of the extent and cost of paper fraud spreads fast. Find out more about how it can protect your customers and build your profits.